The best way to save money on your next Byron Bay holiday is to create your own package, including flight, accommodation and car if you wish. When you get here immerse yourself in the popular surf culture, beautiful white sand beaches and lush tropical hinterland of Byron Bay. Book a cheap flight to Byron Bay with Virgin Australia or Jetstar and choose your own holiday package with accommodation deals from Byron Bay Accom. Virgin Australia operates flights to Ballinabyron airport every day, direct from Sydney. Virgin also has multiple flights daily from many Australian cities to the Gold Coast. Jetstar flies direct to Ballinabyron from Sydney and Melbourne. Jetstar also has multiple flights daily from many Australian cities to the Gold Coast. Book a flight with Virgin Australia or Jetstar and enjoy super savings on accommodation with our hot deals. Enjoy up to 40% discount on selected Byron Bay properties if you book for 3 nights or more, depending on the time of year. Relax on the Beautiful Beaches of Byron Bay with Holiday Packages from Byron Bay Accom. 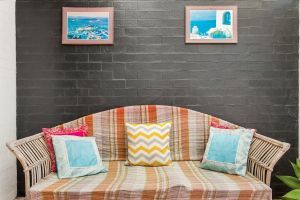 Byron Bay Accom is the largest accommodation booking service in the area with a great range of accommodation from budget to luxury, last minute deals and other discount accommodation. Our aim is to provide you with budget accommodation in Byron Bay so that you can spend your savings creating the best holiday possible..
We have a wide range of beach houses, villas, backpacker guest houses, resorts and private apartments to suit every traveller's style and budget. Equipped with contemporary facilities, Byron Bay Accom aims to offer the best accommodation option for a comfortable and memorable holiday. Book a Byron Bay holiday house, stay with us and we are sure you will have a great experience. Have a look at our amazing deals or contact our customer service to book your holiday.